ACQUA COLONIA from the House of 4711 is a range of fragrance compositions to inspire the body, emotions and senses. Selected natural ingredients with mood-enhancing properties are combined to create new and surprising fragrance creations. 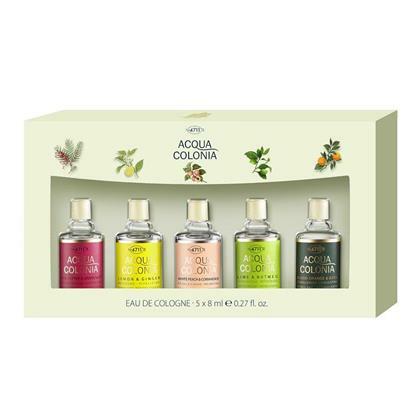 The five most popular ACQUA COLONIA fragrances are presented in miniature editions of the famous 4711 Molanus bottle, suspended in a transparent gift box. ■This item can be pre-ordered only for international flights depart/return Taoyuan and Taipei International Airport.